Time to see it go, been with me for a loooong time. im open to offers by PM. Anyone wants to have it? Please , take care about this "for sale" . It seems that there as some trouble in the past with french buyer. So ,the French thread is closed now for scam . And dear MaverickPT ,if it s not a scam , please post more videos and photos but not this only one video or photos take from this video. And the "tilt shift filter" on your photo is not the best way for sell a slot machine, except for hide some trouble on it !!!! are you crazy or something?? I took this photos myself and filmed the video myself in MY living room. The online video is MINE too. It seems like you dont know the difference between amateur photos and a professional photo shoot. I hardly sell machines and when i do i personally take care of postage so that nothing fails. I thought that this machine deserved PROFESSIONAL photos so i hired a photographer. 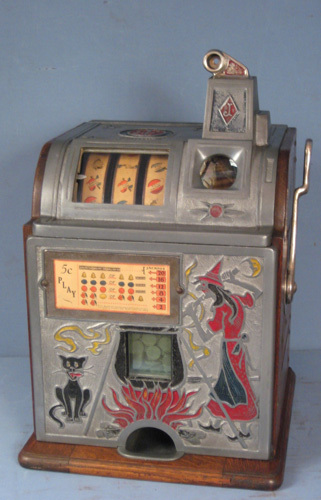 I have about a hundred of antique slot machines and pinballs, and some of them extremely rare pieces. Now its time to start downsizing my collection. I dont know why you decided to post that message here, pleasure?? You dont believe that this exists? ?-...its making me laugh... really. i had no trouble whatsoever with any french or other buyers before. Instead you should have PM me before so you would know how serious i am. Before you influence anyone with that bad SCAM feeling you dropped. You see there are machines and machines. You want me to take rough mobile photos to the machine so you believe this??? "Tilt filter" what??? I CANNOT believe that. I paid a professional photographer to have the best looking photos and video and some French guy tells its a model??? Are you out of your mind??? If you consider yourself a good collector (if you are) remove your message and respect my sale! if you want ill make another video with my phone with terrible colors and terrible lights so that you can see how WONDERFULL this machine is. Hope you understand that your position is way out of bounds here. Stephane there are other machines than Paces and Rollatops. this time with the "fake" machine and with a "fake" cat. i don't get it? stephane merely posted a warning to be careful, because he saw what HE thought might be a phony sale. it's guys like him that have saved MANY of us from ourselves. people sell stuff they don't own, or that is bad, all the time. he DID say "if legit"..... no need to come unglued. MY thanks to stephane for watching out for the rest of us. keep it up, our resident phony-phinder that we relied on for so much has passed on, so he's got big shoes to fill. Well, i dont know Stephane. You know when you get really high efforts to sell one of your precious things, and suddenly comes a guy with bad advertising coming from nowhere?? Thats how i see it. Asking for detailed photos by PM can be a quick check right? easy and discrete from my point of view. All of us as buyers should do it. I do it every time. I just give a " Warning " ! Everybody here are adult and able to look closely about this and make his opinion . So , that was just a warning after follow the French thread and no reply on it from you !! No more comment about this !! -You are right , I m a newbee ,I don t know Nothing about Slot pinball,Juke ! !Nothing , Nothing ! And so sorry about the photo below , impossible for me to resist ! I really take this professionally and seriously as in all i do. So im not making fun from posts from others or start judging as i feel like. Still, if you are some kind of moderator in this forum i think you should really change the approach to this "scam verifying" process of yours. And Randyw thanks for your message but im almost sure that if it was your sale and someone showed up warning that MAYBE your sale its a scam and after that still makes a dummy of your photo shoot, you would laugh a lot about it. I really thought that this would be a good place to advertise my collection downsize process since i thought that it would be serious. And Stephane by your last photo: "adult" you say? You were not able to write a positive post or even admit that MAYBE youre wrong. And thats a professional behavior on my point of view. What a nice experience. Keep up the good humor. For me humor should be in the right places. Im sorry, im not feeding this anymore. that burtmeir machine you have is a very scarce machine, and if anybody was a SERIOUS collector, i can't imagine they would NOT get a phone number and call you about it. stephane did NOTHING that would deter a serious collector from persuing your machine. i suppose there are many collectors out there that will buy something by using emails and social media to buy something, but if it's an $8000 item, it requires a phone call by ME. i NEVER buy anything antique worth more than a hundred bucks without talking to the seller. i have seen dozens of people scammed in my (internet) life. and i have kept people from falling for scamming. if we are so afraid of hurting someone's feelings that we can't speak out when we suspect something is wrong with a sale, then there WILL BE scammers on this site too. i think most know by now that they won't get away with anything HERE....because we have a great group of collectors that will "see something, SAY something". there are a couple of members on this site that have saved me from myself MANY times over the years, saving me many thousands of dollars. when I start selling MY collection on this site, and stephane should call me out on something, i will respectfully respond to it, and know there's no harm done in being CAREFUL. ..... good luck with your sale!